Most teams in GOV.UK have screens set up to show data about pull requests, released and/or current work. Most often displayed are the deploy lag radiator, the fourth wall and the team’s Trello board. 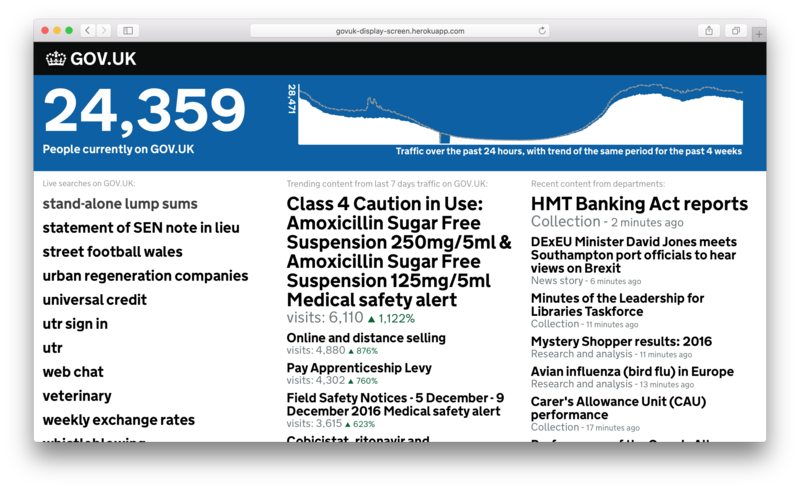 The search screen displays live data from GOV.UK. It includes the number of people on GOV.UK, latest searches, trending and recent content. It’s not publicly accessible because there’s sometimes personal data in the latest searches. There are two screens by the 2ndline desks. The top screen is a webpage running frame splits with two splits: production health and Icinga alert summary per environment. 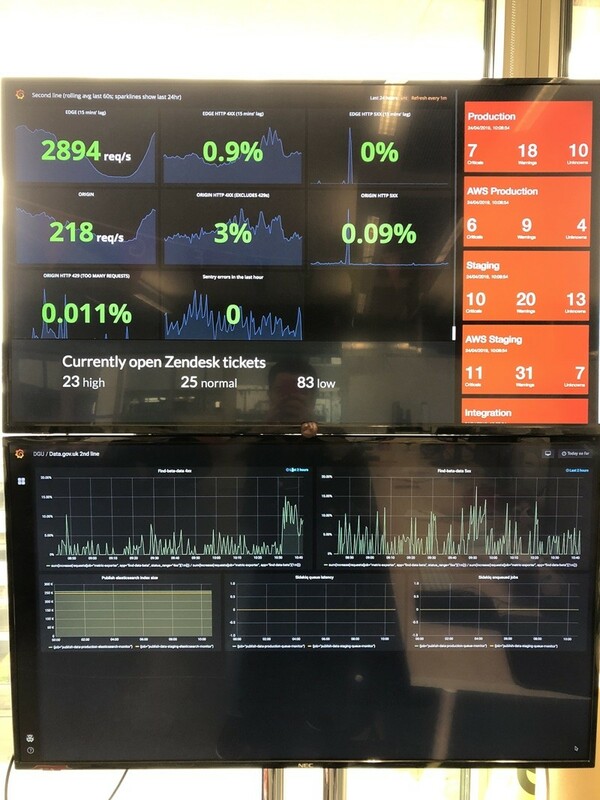 The bottom screen is a PaaS-hosted Grafana dashboard showing statistics for data.gov.uk. This dashboard contains 2 graphs, one of origin 4xx and 5xx, and one of edge 4xx and 5xx. It’s worth keeping an eye on this and looking for any anomalies, as this may indicate issues on production. It’s likely due to our caching behaviour that the top graph of origin errors will indicate issues before they are visible in the second graph, and to end users. If this happens, restarting collectd on the monitoring server may kick things into life. This screen shows a summary of the critical and warning alerts for our four environments (production, staging, integration, CI) plus upcoming AWS environments in a colour-coded box (red for critical errors, yellow for warnings, purple for unknown errors and green for no issues). This is powered by blinkenjs which is deployed to Heroku on the govuk-secondline-blinken app. You must be in the office or on the VPN to access the Icinga instances it gets its data from. This page was last reviewed on 6 September 2018. It needs to be reviewed again on 6 September 2019 by the page owner #govuk-2ndline .